This page on Wikiversity is being created to provide a space for documenting efforts to improve schools. There seems to be a broad consensus that there are problems with many schools but little consensus on what actions would actually lead to improvement. The first section provides an overview of relevant research. This is followed by a discussion of the current status of the Kansas City, Missouri, School District (KCMSD). Problems there have been in the public eye at least since 1977 with a series of court rulings that ultimately led to the 1995 Missouri v. Jenkins decision by the US Supreme Court. This article ends with some comments on the role of the media in issues like those discussed here. This is posted to Wikiversity to invite others with relevant information to correct deficiencies in the current information provided and document experience in other school districts. This review begins with a summary of research by Hanushek and Woessmann quantifying how education quality impacts economic growth. The school-to-prison pipeline is also discussed. Comments by Frederick M. Hess are reviewed along with sources of data on school achievement. Hanushek and Woessmann found that an increase of one standard deviation of student achievement scores translated into a one percentage point increase in economic growth years later, because better educated adults develop and learn new work methods more easily. This model explained 73 percent of the variability in growth rates between countries. To help people understand the impact of their findings, they simulated the results of reform policy that over 20 years increased achievement scores by 25 points in the standard PISA (Programme for International Student Assessment) scores. This is a conservative assumption, because most of the rapidly improving education systems in the OECD (Organisation for Economic Co-operation and Development) improved more than that in ten years, half the time assumed by Hanushek and Woessmann. A decade after the end of this simulated reform, the average annual income (GDP per capita) would be three percent higher; 20 years later, it would be 5.9 percent higher, and 40 years later it would be 15.3 percent higher. Sixty years after the end of this reform period, they estimated the average annual income would be 26 percent higher. Any reasonable increase in the education budget required to pay for this will be recouped fairly quickly -- and will continue to generate free returns as long as the model assumptions hold. The increase by 40 years after the start of the simulated reform would pay for the entire education budget of over 75 percent of the 195 members of the United Nations; the United States was part of the 75 percent. In other words, three quarters of all countries that achieve this modest level of success from education reform will be able to pay for their entire education budget from the resulting improvements in income. This is income they would not otherwise have, because less well educated adults cannot as quickly develop and learn new more productive work methods. This analysis might be a bit more understandable if we restate it retroactively: If the educational achievement of a given country 60 years ago was a quarter of a standard deviation less than it actually was, the average annual income today would likely be 29 percent less than it is today. The claim that "We cannot afford" any reasonable budget is contradicted by the fact that the average annual income in the US doubled in the forty years between 1973 and 2013, after having doubled in the previous 30 years; see the accompanying plot of "Real GDP per capita in the US, 1790-2015." "[S]imply providing more resources gives little assurance that student performance will improve significantly. ... [H]ow money is spent is more important than how much money is spent. ... [E]mphasizing incentives that are related to the desired outcomes rather than how to achieve them may be more productive." "Decentralization of decision-making has been hotly debated ... . Our central findings are ... that autonomy reforms improve student achievement in ... developed countries but undermine it in developing countries." "[T]eacher quality is extraordinarily important and likely the most important factor in schools. ... [However], the inability to identify specific teacher qualities associated with higher student achievement makes it difficult to regulate or legislate the presence of high-quality teachers in classrooms." Focus "institutions and incentives on knowledge outcomes." Equal opportunity in knowledge acquisition is improved by improving preschool and delaying the age at which students are tracked into vocational vs. general curricula. "[T]he propensity to use vocational rather than general education may be an underlying cause of growth rate differentials between the United States and Europe." A graph of the incarceration rate under state and federal jurisdiction per 100,000 population 1925–2008 (omits local jail inmates). The male incarceration rate (top line) is roughly 15 times the female rate (bottom line). 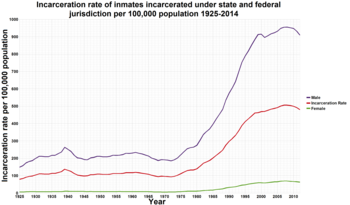 For the half-century prior to 1975 the incarceration rate in the US was fairly constant at roughly 0.1 percent of the population, as indicated in the accompanying figure. Many of the changes in US law listed as drivers of the "school-to-prison pipeline" occurred during the last quarter of the twentieth century and may have been large enough to explain this increase. What does this say about proposals to provide tutoring for every child not reading at grade level? This judgment could be made by any competent elementary and secondary education teacher, even if s/he did not have time to provide the required tutoring. If appropriate intervention in kindergarten through fifth grade can get nearly 100 percent of children reading at grade level, at minimum, in a generation, no one convicted of a crime would be reading at or below a fourth grade level. The nation would have a more literate prison population, and probably a substantially smaller one, because most of those would current cannot read adequately would have economic opportunities they currently do not have. If only 30 percent of that 70 percent wound up in prison, it would reduce the current population by 49 percent (to 51 percent = 0.3 + 0.3*0.7) -- and this does not count the likely increase in the rate of economic growth years later, mentioned above. This is supported by anecdotal evidence as well: A juvenile justice officer reportedly claimed that youth with problems at both home and school are repeatedly referred to juvenile justice. If they have have problems at home but are doing well in school or vice versa, they get referred at most once to law enforcement. Another juvenile justice official claimed that youth in after-school activities never appear in their case load: They're too busy to get into trouble. Has this been researched? If yes, to what extent does it seem accurate? This claim is supported by Youth Ambassadors-Kansas City: In the fall of 2016, the two founders of Youth Ambassadors claimed that in their five-year history, they've had 750 at-risk youth, mostly teenagers, in their program. Four or five have had encounters with law enforcement but none received criminal convictions. They claim the most important part of their program is keeping their at-risk participants involved in supervised activities. To encourage attendance, they pay the youth minimum wage to stay after school and come in on Saturdays. Other programs beyond Youth Ambassadors also provide healthy after-school activities for at-risk youth. To what extent do these programs check reading skills and provide tutoring if needed? To what extent has their effectiveness been studied and found to be effective in improving educational achievement and keeping their participants out of the school-to-prison pipeline? Might all this suggest that a teenager with a behavior problem should automatically be referred to a tutor, who can check the child's reading skills and provide help? To what extent has this been tried, and what were the results? Frederick M. Hess claims that every year the US produces several new education reform initiatives -- far too many for the system to digest. Many are like stone soup: The pilot is introduced with considerable fanfare and supportive discussions with administrators, educators, and families of students in participating school(s). And truly astounding results are obtained and published in suitable prestigious journals. That success is leveraged into a massive roll-out to many other schools, where the results rarely if ever live up to expectations. Why?, Hess says the subsequent poor results stem from transferring only the "stone" of the specific educational reform without the input and and subsequent support from administrators, educators and families of students. "[T]he urgency and optimism borne of well-meaning passion frequently tempts reformers to wave away complexity." "[T]his helps us appreciate the value of humility, good judgment, and hard-earned experience." To deal more effectively with this situation, Hess said we need to be patient and respectful of others, especially school administrators and teachers, many of whom have substantial experience in education, including with a variety of educational reform efforts. And we need to be humble: The world is rarely as simple and our wisdom rarely great as we believe it to be. We can learn things we did not know while building a team for effective action by listening to others and supporting others' ideas when doing so seems likely to increase the commitment of others to common goals while also increasing the chances for success of the team effort. On the other hand, patience can be a vice, especially if patience implies failing to push and probe for ways to improve long entrenched inadequate systems. Part of the problem is the difficulties of evaluating the impact of any specific implementation of a reform initiative, discussed in the next section. Government and nonprofit organizations often have multiple and sometimes conflicting goals. It is often difficult and expensive to quantify the extent to which goals have been achieved. These should not be excuses for failing to account for results. The costs of failure are often massive but so hidden that people become desensitized to the problems and fail to see the opportunities for improvement. Evaluating commercial products and services is, in theory, relatively easy: Profit performs that function: Customers don't buy if the price is too high. If the quality is poor, customers don't come back or sue for false and misleading advertising. Fortunately, it is often easier to get agreement on objectives than means, which suggests it should similarly be easier to get agreement on evaluation criteria. One way to reduce the cost of assessment is to only do it relatively infrequently. It was 16 years between the First International Mathematics Study and the Second International Mathematics Study. Repeats have since gradually become more frequent, as discussed in the next section on available data. Another method for reducing costs is random sampling: Only evaluate a sample of students or schools in a program, for example, with the selection of subjects (students or school) being done by random numbers independent of what the administrators or teachers actually do. Current data on public schools in the US is available from schooldigger.com. They "have test scores, rankings, school and district boundaries, student/teacher ratios, ethnic makeup, and scores of other useful metrics and information for over 120,000 elementary, middle, and high schools in the United States". They collate data from various sources including the NCES in the US, the US Census Bureau and departments of education in individual states and the District of Columbia. Up to 20 years of demographics and 10 years of student test scores are available for a fee from Schooldigger.com, but you must write your own Application programming interface (API) to actually access the data. National Assessment of Educational Progress data are apparently available without special permission at the state and national level in the US. The Kansas City, Missouri, public schools have a tragic history of problems. In 1977 the KCSD sued the state of Missouri for help in desegregating. The district court named KCSD as a defendant but also required the state to fund whatever it took to improve the quality of education. Eighteen years later, as Missouri v. Jenkins, the US Supreme Court overruled the lower court in saying that the state did not have to fund salary increases and remedial education programs to correct inequality in schools. Sadly, the scores on the National Assessment of Educational Progress, discussed above remain tragically low in many schools in KCSD. In August 2016 former Kansas state legislator Tom Love told KSHB Channel 41 that the district gets funds from the federal and state governments for remedial reading tutors for at-risk children in K-4, but the money is being spent elsewhere. If that money were redirected to the at-risk children in K-4, who are not reading well, we could get 95 percent of the kids reading at grade level. If this is accurate, and if we could also keep at-risk youth involved in quality after-school activities through grade 12, as suggested above, we could potentially cut to nearly zero the rate of entry into the school-to-prison pipeline. Progress on many if not all substantive issues is blocked, because every countermeasure threatens someone with substantive control over the media. Private schools probably have higher advertising budgets than public schools; if so, this would give the mainstream broadcasters a conflict of interest in honestly discussing the available data. Beyond this, one suspects that the people who control major advertising budgets in the US do not want the public to believe that the government can do anything positive except when it support the efforts of US multinational corporations to do whatever they want in the US and around the world -- and the editorial policies of the mainstream media, most especially the mainstream commercial broadcasters, have been largely skewed to support this political agenda. To do otherwise would require the media to regularly bite the hands that feed them. ↑ Hanushek and Woessmann (2015, Table 3.1, p. 43, and pp. 10, 11, 168). Their results are based on combining academic achievement scores from 19 different international comparisons between 1964 and 2012.; see Table 2.1, pp. 18-19 and Appendix 2A, pp. 29-37. ↑ The same model considering years of schooling rather than achievement scores explained only 25 percent of the variance of growth rate: R-squared = 73 vs. 25 percent. The much better fit justifies the work they invested in transforming all 19 different international comparisons onto a common scale while also explaining why previous researchers failed to find a strong education effect based on years of schooling. ↑ A 25 point PISA score improvement amounts to a quarter of a standard deviation improvement in test scores. Hanushek and Woessmann (2015, p. 161). ↑ Hanushek and Woessmann (2015, pp. 162-163). ↑ More accurately, the GDP would be 1/1.29 = 0.78 of what it is today, or 22 percent less, rather than 29 percent. However, given the other assumptions in this analysis and the statistical uncertainty, it's highly likely that the GDP would be substantially less. A careful analysis of the statistical uncertainty in this model would be needed to estimate a probability distribution for how much lower the GDP would likely result from a quarter standard deviation reduction in achievement scores 60 years ago. However, it's clear that over 75 percent of the UN would lose at least 22 percent of their GDP from poorer cognition in their populace, and some smaller portion of countries would lose more than 29 percent, etc. ↑ Hanushek and Woessmann (2015, p. 188-190). ↑ Hanushek and Woessmann (2015, pp. 190-191). ↑ Hanushek and Woessmann (2015, pp. 193-194). ↑ Hanushek and Woessmann (2015, p. 194). ↑ Hanushek and Woessmann (2015, pp. 198-202). ↑ Daniel Kahneman won the 2002 Nobel Memorial Prize in Economics for path-breaking research that showed that people make too many decisions based on what comes readily to mind and are more confident in those judgments than the reality warrants. Experts are as susceptible to this effect as others. This helps explain why it's so important to be humble. Kahneman is a psychologist, not an economist. He won a Nobel prize in economics, because his research showed that they way people think is substantially different from standard economics models of the "rational person." For a summary of that work, see Thinking, Fast and Slow. ↑ Audits ignore small discrepancies, because they are not "material." The rules for "materiality" are defined in Generally accepted accounting principles (GAAP). ↑ This assumes that externalities are negligible or substantially internalized through government regulations. Unfortunately, with many businesses, neither is true. In cases where externalities are not negligible and not internalized through regulation, market failure generates a race to the bottom, destructive of society. ↑ Their current official name is "Kansas City Public Schools". However, there are also public schools in Kansas City, Kansas, in the Kansas City, Kansas, Public School district that are not part of the Kansas City Public Schools. For this reason, we will here refer to them under their former and more descriptive name as the Kansas City, Missouri, public schools.